Mangrove Cay is an island within an island, separated from the rest of Andros by water to the north and south. The Cay is home to approximately 800 people, many of whom are related and almost everybody knows almost everybody. Like most islands of The Bahamas, people survived by fishing, farming and boat building. Sail boats were the main mode of transportation of people and goods between the islands but began to disappear by the 1950’s. Today, the art of boat building is preserved by the building of sloops for racing. 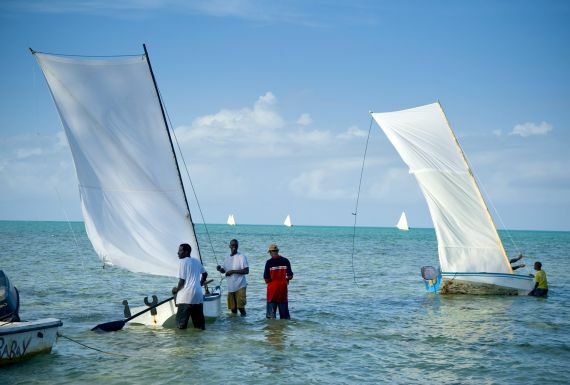 The main competition or regatta is held on Mangrove Cay every year on Mothers’ Day weekend. Sponging is also an important local “catch”. Sponges are actually animals that grow from roots and are harvested, leaving the roots intact. 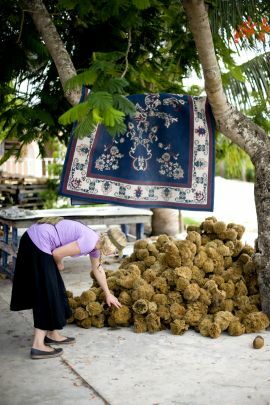 The sponges are cleaned, trimmed and sold for use by artists and are popular in shops selling natural bath and beauty products. Mangrove Cay is one of the major commercial fishing centers of The Bahamas. Every lobster season, 12 to 14 boats go to sea with a crew to dive for spiny lobster, or as it is called locally, crawfish. Each boat can have a catch of 100,000+ and lobster is by far the major contributor to the local economy. Many individuals take their small boats out for a day of diving and fishing, either for their own consumption or for a catch to be sold. They frequently stop at our dock on their way back into shore and we select our fresh fish, conch and lobster for dinner. We also buy local produce whenever possible. In addition to the ocean, the island of Mangrove Cay is home to a vast network of caves, exceptional fresh water, and very picturesque churches. The lodge has bicycles on-site, and it is a wonderful island to explore by bicycle at the end of your fishing day. Living on an island tends to shape people’s character and in addition to being polite and friendly, they are resourceful, independent and resilient, all of which are desirable attributes for guides. All of our guides are local men that have been fishing, diving and sponging most of their lives on the same waters that they now guide for bonefish. We never had to teach a guide how to see a bonefish or how to find his way through the Bights. Mangrove Cay is a wonderful island within the Bahamas’ biggest island. It is a great base for your Bahamian fishing trip. Andros Island is the largest of The Bahama islands. It is only a short flight from Nassau, Miami or Fort Lauderdale. Despite its convenient access to the US, it is mostly uninhabited and unspoiled, protected from development by its shallow water shorelines and lack of natural harbors. Flat and heavily forested, Andros is not a single island, but a labyrinth of islands, cays and waterways. It extends about 100 miles from north to south and 45 miles east to west at its widest point, with an area of 2,300 square miles. Andros is also one of the least populated islands with a mere 8,000 souls. All live in small settlements on the eastern side of the island leaving the vast interior and western shores untouched. To our first time visitors, it is almost incomprehensible that such a place can still exist in the world, especially so close to the United States. 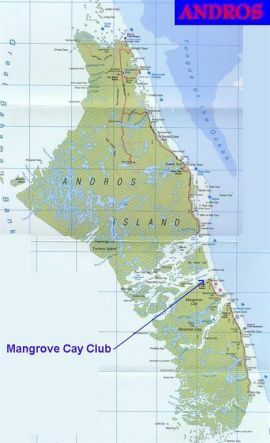 Mangrove Cay is an island in the center of Andros which is separated by waterways that bisect the island from east to west. These are the North, Middle and South Bights, themselves dotted with countless uninhabited cays. This collection of mangrove forests, shallow shores, vast banks and flats make up the largest area of bonefish habitat in the world, establishing Andros as the Bonefishing Capital of the World.